A Truly Super Entertaining Effect. A classic of magic. 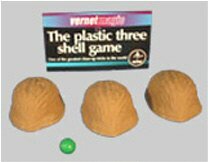 This is the very old game in which the spectator try to follow the position of the pea under one of the three shells spread on the table.